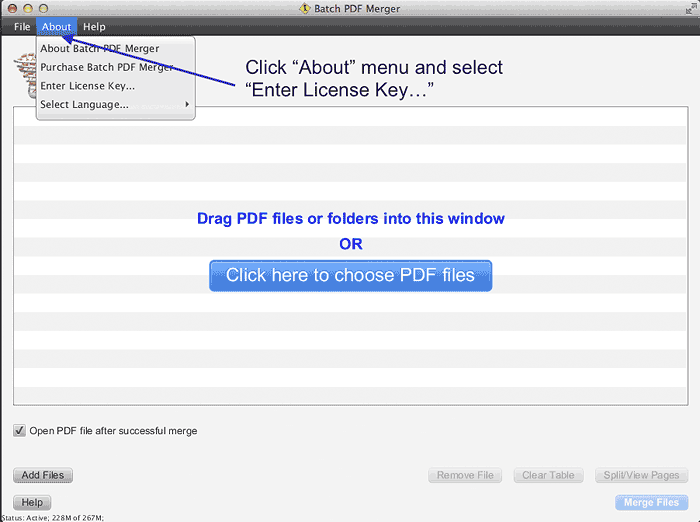 If Batch PDF Merger is not already installed on your computer, please download the latest version of the program by going to our Download Page and select your operating system (Mac or Windows). To activate the key and use the program, you need to be connected to the internet. From your Desktop, double click the Batch PDF Merger shortcut icon to start the program (for Mac users, the icon is located in your Applications folder). Click "About" menu and select "Enter License Key". Enter the license key provided (note: zero digits ("0") are used in our keys, not the letter "O"!). Lost your key? Note: For subscribers upgrading to the latest version, make sure you have downloaded and installed the newest version here. Click here to see short video of this activation.